100 x 1ml BD Micro-Fine 29G Insulin Syringe 1 2 needle. 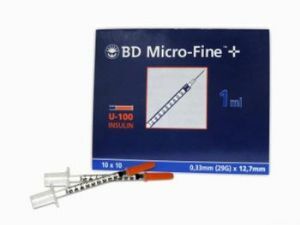 100 x BD Micro-Fine fixed 1/2" needle 1ml insulin syringe at great price. These syringes are not individually blister packed, they are supplied in bags of 10, with plunger caps to ensure sterility.